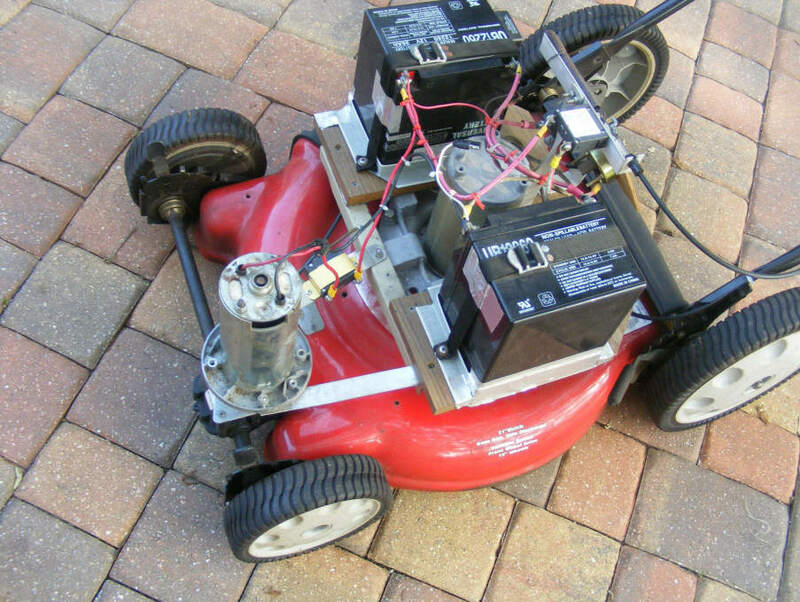 In the past Lee has described his project to convert a Troy-Bilt gasoline powered mower to a battery electric mower, and then went on to provide solar charging for the mower batteries. Lee's latest project is to add electric powered self propulsion to the mower. First version of the gas mower converted to electric. The new self propelled mower uses a drive unit salvaged from another scrap Troy-Bilt self propelled mower. The new self-propelled mower with larger batteries. Thanks very much to Lee for sending this material in! This thing is awesome! I look forward to the next iteration with mechanical arms to do the raking, ;-) I wish I could find a local supplier for DC motors. Nice to see people seeking alternativ power systems. I have seen a PV powered lawn mower at a show. Of course it had a battery backup. The mower would just be left outside to keep the batteries charged. Mowing on a sunny day would make the most sense for manny reasons. Hope to see more solar applications like this. "Re: a local supplier for DC motors. If you’re not too particular about the motor you want, one good source is Craigslist. I’ve had good luck running an ad off and on for the past year that says “Non-working cordless electric lawnmowers wanted” and have gotten 11 such mowers, paying between 0 and $20. All of them had DC motors in good condition – one was a 12 volt motor, two were 36 volt, and the rest were 24 volt – four of the motors were 1 hp, the rest were 1.5 hp. The motors generally need a good cleaning and sometimes the brushes need to be replaced, but you can’t beat the price. My experience with these motors, such as the 1.5hp 24v Black & Decker motor, is that they are virtually indestructible – with reasonable care and minimal maintenance, such as replacing the brushes, they should outlive you. Another nice thing about a motor from a cordless electric lawnmower is that it always has some kind of flange at the business end for bolting it down. Also, the shaft usually protrudes 1-2” and is either threaded or tapped or keyed or has a flat ground into it, making it easy to attach a belt pulley to the shaft or to bolt something into the end." Thanks, Gary. Craigslist hasn't seemed to caught on around here but a perusal though Kijiji might have netted me a working mower. I think I will post an ad for non working mowers in the fall.